Extreme : TheyWilllRockYou.com – For the love of music! Serving Boston and Greater New England. In 2008, after 13 years apart, Extreme reunited for their ‘Take Us Alive’ world tour, which covered 75 cities and a handful of continents in support of their latest release “Saudades de Rock”. On the last night of the tour in their hometown of Boston, the band took the stage in front of a sold out crowd at The House of Blues to record what would become their “Take Us Alive” live dvd/cd release that came out this week (May 4th). 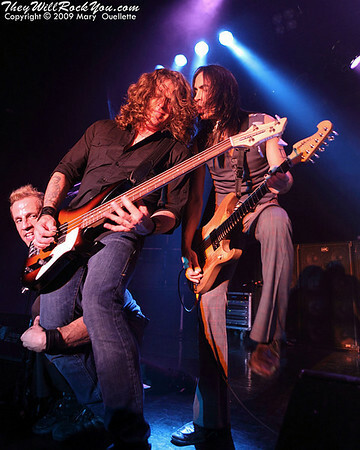 The band in its current line-up (Gary Cherone on vocals, Nuno Bettencourt on guitar, Pat Badger on bass and Kevin Figueiredo on drums) took the energy of the entire tour, bottled it and let it all out on stage that night in true Extreme fashion– forever captured for Extreme fans to enjoy for years to come. Committed to making new music and not just a one time “reunion” tour, Extreme is already working on new music and looking forward to sharing it with their fans in the future. A few years ago “the future” of Extreme didn’t seem like much of a possibility but a lot can change in a year! I recently had a chance to talk to frontman Gary Cherone about the band reuniting, their recent tour with RATT and “Take Us Alive”. As reported earlier, Extreme will be joining Ratt for some summer tour dates. What was missing from the list of shows was a hometown Boston show. It has now been added! They’ll be finishing up the tour on August 8th at The House of Blues in Boston. RATT and EXTREME have teamed up to bring you this summer’s most rockin’ tour lineup. The tour, which will feature sets from both bands with Ratt closing, kicks off on July 12 in Amarillo, TX and runs through August 7th in Hampton Beach, NH. More to be announced soon. In celebration of the 25th anniversary of their landmark debut Out Of The Cellar, RATT will be playing the album in its entirety.